Burlington's so-called "student ghettos" have plagued the Queen City as long as it's been a college town. Students drive up rents, making it harder for young families to find affordable housing, and their crowded "houses" can turn once-quiet neighborhoods into 24-hour party zones. Every city administration in recent memory has wrestled with this existential town/gown dilemma: The short-term population that contributes to Burlington's intellectual and economic vitality also threatens its livability. 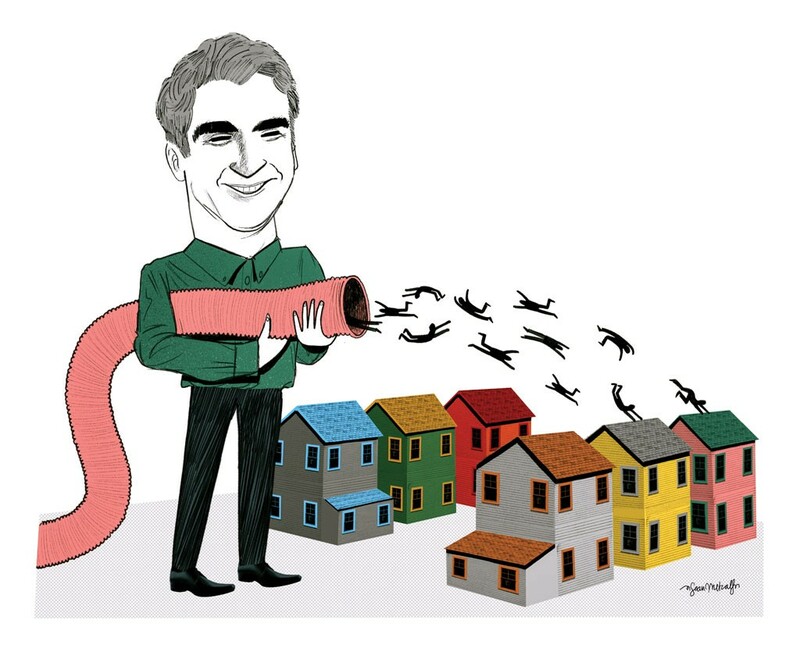 Can newly reelected Mayor Miro Weinberger find a solution? He's committed to trying. The mood was triumphant at Champlain College last month when Weinberger announced the resolution of the most recent legal dispute challenging the school's proposed 290-bed student apartment building on St. Paul Street, dubbed Eagles Landing. It was a big step toward what Weinberger described as his "pretty bold goal" of housing 1,500 more students in Burlington over the next five years. Building designated student complexes closer to downtown, he reasons, will reduce pressure on the housing market, draw students out of neighborhoods, and allow the city to rehabilitate ramshackle houses that fall prey to partying students and neglectful landlords. Roughly 3,000 undergraduates live off campus in Burlington, including 2,200 from the University of Vermont and several hundred from Champlain College. High demand for housing makes it a landlords' market, and they maximize their profits by carving up houses into multiple units. Students say a city ordinance that prohibits more than four unrelated people from occupying a house is widely flouted. "Quality-of-life concerns," as officials refer to them, often ensue. Last year, a group of neighbors, fed up with nightly fireworks near Loomis Street, showed up en masse at a house to confront the culpable students. And on a recent weekend, a pair of city councilors encountered a random couch obstructing traffic in the middle of South Union Street. Residents complain of students' noisy, nightly migrations to and from downtown. In 2007, Champlain College, which requires only first-year students to live on campus, committed to housing all of its nearly 2,000 students. To meet that goal, school officials said they'd build 600 beds on campus and 600 more at off-campus properties purchased for that purpose. Since then, they've added 450 beds on their hilltop grounds and zero elsewhere, but not for want of trying, according to senior vice president David Provost. Champlain bought the former Ethan Allen Club building on College Street in 2009 with the intention of housing 200 students there. It later purchased the old Eagles Club on St. Paul Street for a 300-bed project called Eagles Landing. Champlain pursued the latter first, determining that it would be easier to get approval. Two and a half years and three legal disputes later, Provost sounded a bit shell-shocked from the experience. With so much of its energy focused on Eagles Landing, Provost said that the college has no immediate plans to pursue its Ethan Allen Club project or the other beds it's committed to building. UVM has a policy of housing 60 percent of its undergrads on campus — freshmen and sophomores are required to live on campus — in approximately 6,100 beds, according to school officials. Its only expansion plan is to demolish three dorms known as the "Shoeboxes" this spring and replace them with larger buildings that would add a net 308 beds total by 2017. During construction, 391 additional students will have to find housing, either at the Sheraton Hotel or the Quarry Hill apartments in South Burlington. Or they can find their own digs. Such displaced students would likely flock to the new housing Weinberger supports in the downtown area — units he predicted would halve the number of students currently living in the city's residential neighborhoods. Ditto the roughly 1,450 UVM undergrads living outside the city. Likewise, Champlain College currently houses 270 students at the Spinner Place apartment complex in downtown Winooski. At some point, the college will terminate that lease, creating another crop of students looking for off-campus housing. The mayor has declined to specify which downtown locations he'd like to see developed, sticking to more vague terms like "purpose-built" housing in "thoughtful, strategic locations." In the absence of actual proposals, rumors fly: The waterfront? The northeast corner of Main Street and South Winooski Avenue? At one point last year, the latter location was more than a rumor. A recent housing study commissioned by the mayor identified the Gateway Block, currently host to a city-owned parking lot and an abandoned motel, as having "great potential" for student housing. In executive session, the city council reviewed a proposal that ultimately faltered. "There was some prior interest ... but there's also some resistance to it going there," Weinberger said, referencing concerns it would be an eyesore and therefore an inappropriate "gateway" to the city. Another possible location is the Burlington Town Center, where the owner plans to add housing as part of a massive mall redevelopment project. In theory, Progressive City Councilor Selene Colburn would support the latter — she wants to see students incorporated into mixed-use developments — and her constituents in Ward 1 stand to benefit from large dormitory-style development projects outside their college neighborhood. But the same citizens "are deeply concerned about the transfer of quality-of-life issues from our neighborhoods to our downtown," said Colburn, who is an assistant library professor at UVM. Echoing others, she added, "I'm not ready to give up on the idea that UVM can sustain more on-campus housing." UVM argues that forcing its upperclassmen to live on campus would make it less competitive with peer institutions. Sophomore Tyler Davis confirmed it: He's moving next year with friends to a house in the Old North End that will be cheaper and less restrictive than on-campus accommodations. Davis said nightly resident adviser patrols — and $150 fines for empty alcohol containers — drive students off campus. Given that officials are already trying to discourage the perception of UVM as a party school, such policies are unlikely to change. Davis thinks a third housing option — such as the apartment-style building downtown — would be popular among his peers. UVM spokesman Jeff Wakefield said Weinberger's proposal to put student housing downtown is an "idea worthy of serious discussion and exploration." A survey conducted as part of the school's housing master plan found that 82 percent of students were interested in a downtown housing project, while fewer than 50 percent would live in a similar project on campus. "Who doesn't want to live near downtown?" said Annie Stevens, UVM vice provost for student affairs. The challenge, she said, is designing a project "that's right for students and the city and the neighbors" — and finding a third-party developer willing to take it on. Weinberger's goal will likely hinge in part on the fate of the zoning rewrite he's pushing for, which he says will make it less costly and unpredictable to build downtown. Assuming that students do vacate the Victorians near campus, who will pay to restore those multi-unit, often dilapidated apartments into single-family homes? The mayor has agreed to explore ways to incentivize landlords to renovate those properties that could alleviate the housing shortage that drives young professionals and families to other cities. At the February 26 Eagles Landing announcement, Weinberger said he was especially pleased that Champlain College had agreed to contribute $25,000 to what he's calling "The Neighborhood Project" — a study on how to implement a neighborhood stabilization program. The city will chip in $25,000, and Preservation Burlington is pitching in $5,000. Improving the local housing stock would help with Champlain's goal of keeping its graduates in the area, Provost said. "It's meaningful for us to have a seat at the table." The original print version of this article was headlined "Build It Where? Burlington's Mayor Wants More Downtown Student Housing"